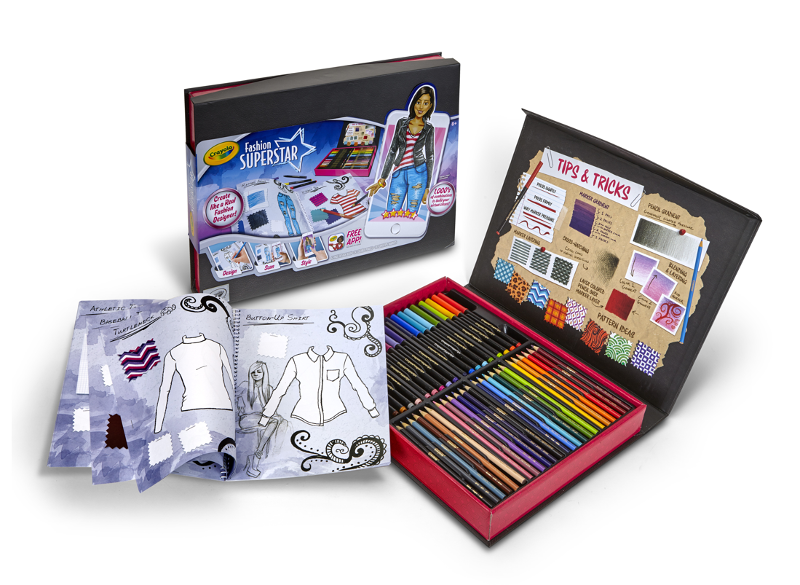 With Crayola Fashion Superstar you can bring your designs to life and create your own styles like a world famous fashion designer! Create 1000+ combinations of dresses, tops, skirts - and mix and match however you like! Build your own virtual closet! Enter fashion challenges to unlock new levels, win rewards and earn "likes" from other designers. Download the free app to get started. 62 Page Design Book,24 Colored Pencils, 18 Supertip Markers, Designer Case, FREE APP. Create like a real fashion designer and build your own fashion empire! 1000's of fashion combinations to mix & match to build your virtual closet. Complete design challenges to earn rewards and unlock new levels. Share, like, and comment on designs with other fashion designers. Compatible with Apple iOS and Android devices. 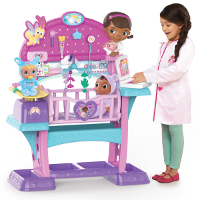 Preschoolers can nurture and care for their baby dolls right alongside Disney Junior's Doc McStuffins with the All-in-One Nursery. This adorable role-play center is full of exciting doctor features and accessories to explore - from the portable electronic laptop with light-up screen and lullaby music, to the light & sound stethoscope for checking baby's heartbeat. After measuring baby's height and weight on the scale, little ones can put their baby down for a nap with the spinning mobile and rocking cradle. Kids will love watching Gavin the Go-Kart go for a ride on the roller coaster-themed VTech Go! Go! 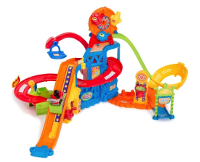 Smart Wheels Race & Play Adventure Park. Crank Gavin up the hill and see him navigate down the track into the catapult launcher; then, launch the Go-Kart to the top of the playset by releasing the catapult and watch as he races down the track, around the 360 degree loop and off the jump ramp! Featuring SmartPoint technology, Gavin responds to all four SmartPoint locations with fun sounds, phrases, three sing-along songs and six melodies. The park also includes a Ferris wheel that spins, a tumble-down carnival game and a swinging gate to strengthen motor skills. Eliminate the frustration of traditional joystick controllers and start the fun right out of the box with an easier, more amazing way to fly! The Aura drone is a telekinetic, gesture-controlled toy drone. 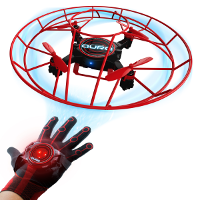 Wearing a special Gesturebotics glove controller, kids pilot the drone by simply moving their hands - just like a super hero! Kids can fly Aura up and down, forward and backward, left and right, and even perform cool tricks like a sideways flip - all with just the wave of a hand! Auto Takeoff and Auto Landing features get kids airborne faster and ensure a safe landing. Aura includes a safety frame for added protection, offering fun and safe indoor play. Gesturebotics is a patented technology powered by LocoRobo Innovations. Previously only used in military applications, this innovative gesture technology introduces a whole new way to fly toy drones - the easiest, most amazing way ever! 5-7 minutes flight time, 6-23 feet recommended indoor range (longer range is possible), 7 to 8.5 feet approx. maximum relative height, 6-axis Gyro Stabilization, Designed for indoor flight. LITTLE LIVE PETS CUDDLES "MY DREAM KITTEN"
The adorable "My Dream Kitten" moves and acts just like a real kitten as it interacts with a child's touch. 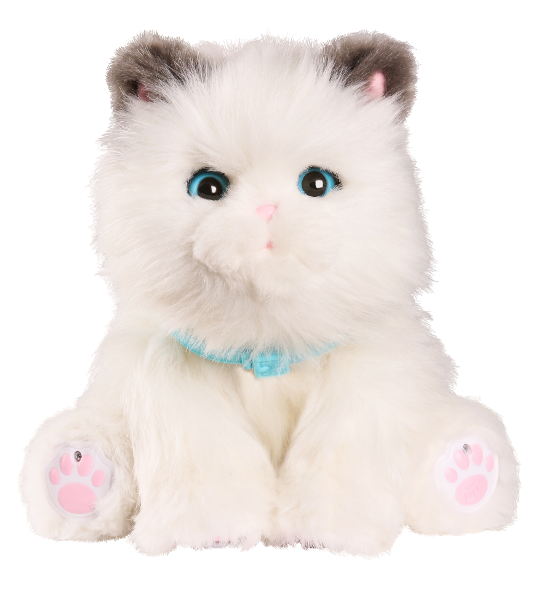 Kids will love how Cuddles opens its eyes, purrs when petted and how much the kitten loves to cuddle! Cuddles is the pet with no mess and makes the perfect first pet as kids learn to nurture and care for their new pet kitten. This SMT is sponsored by Crayola, Just Play Products, VTECH, KD Interactive and Moose Toys.